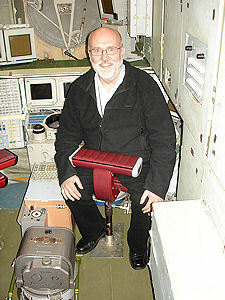 The last week of May 2008 I had the opportunity to fulfill a dream of every spaceflight enthusiast – that of visiting the “roots of spaceflight” in Russia, i.e. the factory where the first Sputnik, the first moon probe and the first manned spacecraft were built under the leadership of the famous chief designer Sergei Korolev, the cosmonaut training center and the mission control center for manned Russian spacecraft (TsUP = Tsentr Upravleniya Poloyotami, pronounced “tsoop”, i.e. Flight Control Center). 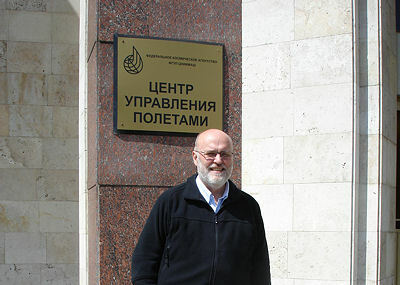 I and another space enthusiast, Bob Christy of Lincoln, U.K., traveled to Moscow at the invitation of Vladimir Agapov, a space debris specialist at the Keldysh Institute of Applied Mathematics of the Russian Academy of Sciences. His friends at Russian space journal Novosti Kosmonavtiki also took care of us! The organization that Sergei Korolev led is nowadays called Rocket-Spacecraft Corporation Energia but still located in the vast industrial complex in a northern suburb of Moscow bearing the chief designer’s name. The only part of Energia open to the “space technology tourist” is its museum where there are exact replicas of the classical unmanned spacecraft such as the first three Sputniks and the first probes to reach the Moon as well as the actual capsules that carried Yuri Gagarin and Valentina Tereshkova into space. It was hard not to feel solemn when I stood in front of the Vostok-1 capsule which carried the first human into space 47 years in the past. It is a museum piece that one can approach up close. This museum is remarkable in its accessibility. One can touch and feel most exhibits and examine technical details at almost microscope distance. Before entering the old factory hall converted into a museum the visitor passes through what could almost be called a shrine dedicated to Sergei Korolev who died in 1966 at the age of 59 after having led his great design bureau for only 20 years and created the first intercontinental missile and then the famous spacecraft that started the space age. 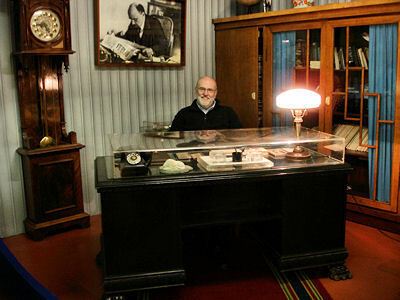 Since we were only a group of two persons it was possible for us to sit behind Korolev’s desk in his office chair. The reconstructed office even contains a photo of Lenin reading Pravda on the wall. The following day we returned to the suburb Korolev to visit the mission control center TsUP located in a part of TsNIIMash, the Central Scientific Research Institute for Machine Building (The Institute plays a central role in spacecraft and rocket technology and reports to Russian Space Agency. The Institute is responsible for system analyses, research and development of spacecraft and rocket programs, as well as for the Russian space program as a whole). There are two major control rooms at TsUP – one built for the Soviet-US docking in space in 1975 (Apollo-Soyuz Test Project, ASTP) and the other built for the Soviet space shuttle Buran. The ASTP control room is used as mission control for civilian space missions and launches of the US/Russian/Norwegian Sea Launch rocket. When we entered the ASTP control room the displays showed that the center supported the Resurs-DK1 earth observation satellite that also carries a cosmic particle instrument – PAMELA – with Swedish participation. There were no staff in the main control room, but we were assured that there were people in the “back rooms”. By contrast the ISS control room in the control center built for Buran was staffed. A handful of persons sat at the consoles. The space station was not passing anywhere near Russia at the time. A rehearsal of some sort in preparation for the launch of the Space Shuttle STS-124) four days later was going on. At the visitors’ balcony there were a couple of telephones with the pictures of the current crew attached to them. These telephones are used by VIP visitors to talk to the crew. Before we left TsUp we were served lunch at one of the small buffets in the center. We all chose borscht – Russian soup – of course. "Soup at TsUP" - I can't resist the pun! After the visit to TsUP we continued in an easterly direction to the Yuri Gagarin Cosmonaut Training Center (TsPK) where we met a very engaging tour guide Boris Yesin, who has retired from a technical position at the center. He took us to the Mir simulator which is a high-fidelity simulator and not just an exhibition piece. When powered up, every button pushed produced a reaction. The simulator is complete with a “treadmill” for keeping fit and a fully assembled toilet. Interestingly, the seats in front of the main control console seem like they are assembled backwards (see image on the right) but in reality this feature keeps the cosmonaut attached to the seat instead of floating away in microgravity. Another high point at TsPK is the gigantic centrifuge used to train crew members to withstand the rigors of accelerations during launch and landing. This centrifuge was built by the Swedish company ASEA (nowadays ABB) and delivered to TsPK from Västerås near Stockholm and taken over by the customer in 1980 – nine years after the contract was signed (negotiations had started already in 1968!). 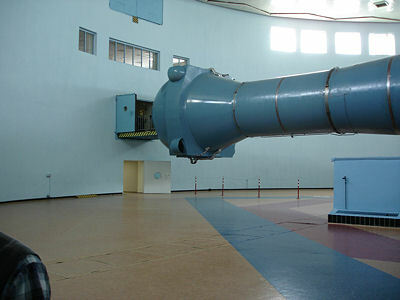 The centrifuge uses what is probably the world’s largest DC electric motor that has a rotor with 4.5 meter diameter and consumes 27000 amperes when accelerating at the maximum rate. The rotation radius is an impressive 18 m and the maximum g-level in the crew cabin is 30 g. The centrifuge is capable of increasing the g-level at a rate of 5 g/s. There are two interchangeable crew cabins for one and two pilots, respectively. The pressure in the cabins can be varied in the range 40-800 mm Hg while the temperature can be controlled between +5 °C and +50 °C. When the centrifuge spins at maximum speed the velocity of the crew cabin is 250 km/h! It felt good to see this massive piece of machinery – a product of Swedish engineering prowess! 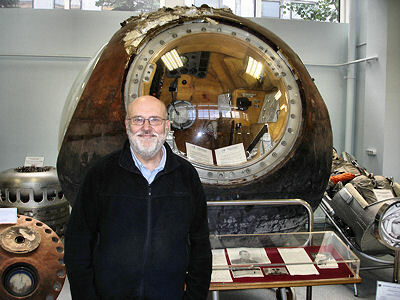 The visit to the Moscow region contained two more visits to space history shrines. We visited the museum dedicated to the president of the Academy of Sciences during the halcyon days of space exploration, Mstislav Keldysh. His office has been preserved as it was in the mid 70’s when he passed away. It was Keldysh and Korolev that drove early space exploration projects. We were shown the original, declassified, documents from the late 40’s examining the feasibility of artificial satellites and long range missiles. Bob and I strolled in the neighbourhood of the Cosmos hotel near VDNKh, the old All-Union Exhibition Centre and the Monument to the Conquerors of Space, Cosmonaut Alley and the new space museum then under refurbishment. On 28, Ostnakinoskaya Ulitsa we found the home of Sergei Korolev, now a museum. Korolev lived there from 1959 until 1966. We had missed the last guided tour by 15 minutes. But we were lucky that a car passed out through the gate so that we could take good pictures of the house. It was established as a museum in1975. 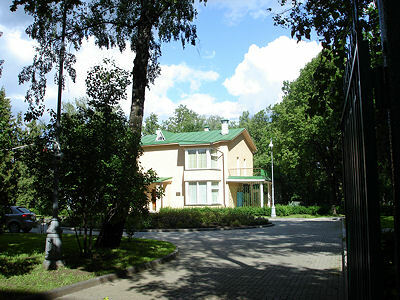 The house is located 1.3 km from the Ostankino TV tower, located near the Ostankino TV-center where dramatic events occurred during the Russian constitutional crisis on 3 October 1993. We also traveled 200 km southwest to the town Kaluga where Konstantin Eduardovich Tsiolkovsky (1857-1935), teacher, scientist and pioneer of astronautics theory lived and worked. There is a space museum and park to his honor and his home and small laboratory in a typical Russian paneled log house is preserved. With that visit our pilgrimage to the “roots of spaceflight” ended.